In 2005 we designed a camera housing, utilising a hired in sensor unit, for a one-off use in turbid waters off the East Coast. The housing produced clear results in very poor underwater visibility but the hired in camera unit had a small memory and could only be downloaded slowly through a short deck lead. We have now completed development of our own integrated system featuring a redesigned hydrostatic pressure housing, a high resolution digital camera, a unique multi-element diffused lighting array and a powerful on-board processor to control lighting and image capture. The processor also provides ample data storage for thousands of images within the unit, and a high speed data link to the surface. The camera outputs live video of each dive, which can be recorded if required, and sends high quality digital images to the surface within a couple of seconds. Data is stored in the camera and simultaneously saved to hard disk in the survey vessel so images are always secure. Still images have a resolution equating to 23 million pixels per square metre of seabed with a frame size of 400mm by 320mm. Remote control of all functions, live video feed and still image viewing at full resolution are all available with the tool deployed. Our survey vessel's ability to hold station is ideal for underwater imaging and we can place the camera within 2 metres of a target. The DP system allows us time to obtain good underwater images, while precise vessel control enables the capture of closely grouped pictures to emulate a replicate sampling technique. We can also recover a sediment sample from within 2 metres of any image site so, in sensitive areas where ‘blind’ sampling is unacceptable, we can avoid taking grab samples on certain stations after viewing the images. Images obtained from the 'Weasel' have enabled our clients to construct GIS biotope maps of the survey area. Each image shows a precise, evenly illuminated area of seabed with very little distortion so the size and numbers of organisms in view can be determined. A second generation “Weasel II” camera is now under construction with a larger frame size, a smaller housing and an increased resolution of 53 million pixels per square metre. 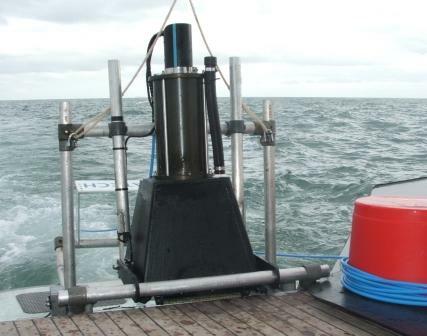 The Weasel system was designed to support a range of underwater data logging and imaging tasks. Future upgrades will include remote recording of long duration videos and time lapse still images. The pressure housing contains an embedded processor which can be programmed for any task including logging of additional parameters such as water temperature, current velocity etc. There will be three complete systems available shortly. For the best results, and most efficient data collection, it is advisable to use our vessel 'Aquadynamic' which is equipped with dynamic position control. We also offer camera systems for use on other vessels, supplied with a trained operator. Please note that 'Aquadynamic' is an extremely sophisticated, purpose-built survey vessel ideally suited to this type of work - many other vessels will struggle to match the accuracy, work rate and image quality we achieve from her.